Lemon verbena is a flowering perennial shrub native to western South America although grows as an annual in New England. Originally cultivated for its essential oil, lemon verbena has many culinary and medicinal uses. 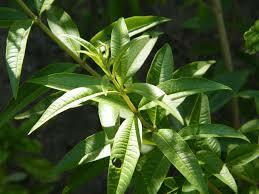 Medicinally, lemon verbena is used for digestive disorders like indigestion, diarrhea and constipation. It is helpful with joint pain, insomnia, asthma, colds, fevers, skin conditions and chills. It also has anti-Candida albicans properties. In cooking, lemon verbena imparts a lemon flavor to any dish and is popular with fish and poultry dishes, marinades, salad dressings, jams, yogurt and drinks. There are many recipes online for making lemon verbena ice cream, sorbet, cocktails and muffins, among other treats. You can also dry the leaves for teas or add to soaps and cosmetics. Lemon verbena can be made into a tea or tincture. This refreshing tea is great for a warm fall afternoon or as an after-dinner drink. Bring a pot of water almost to boil and pour over equal parts of lemon verbena and mint. Steep for 5 minutes. Add honey to sweeten if desired. For a more flavorful and refreshing caffeine boost try adding any combination of lemon balm, lemon verbena, or lemon grass to your mate. Also great with the nourishing addition of oats. Large amounts of lemon verbena may irritate the kidneys.